Always a delight to have closure to every chapter in life. Here’s a follow up to the Seapark fried chicken rice story last two days. Since it can prove to be somewhat a challenge to park within the internal perimeter of the Seapark wet market area, we inched our way further and parked near to A’Han Nyonya Kuih shop; facing a row of terrace houses. And yeah, that famous burger lab is situated directly adjacent to this. But the ‘lab’ only opens in the evening. And A’Han should be closed by late afternoon (if I am not mistaken). You know which shop this reminded me of? 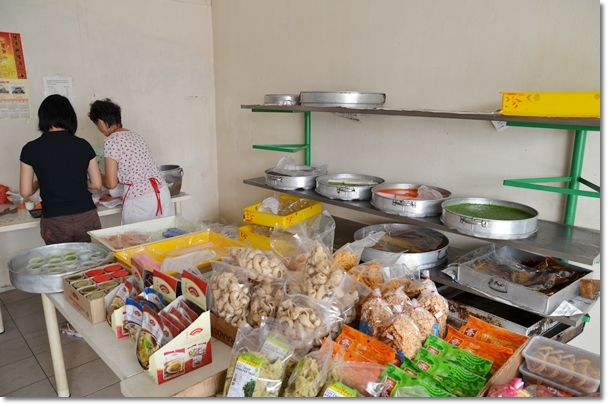 If you’re a die hard fan of Nyonya kuih; those colourful and small, almost bite-sized tea time snacks that can be either savoury or sweet, and found in abundance in Melaka and Penang, then you must have heard of this shop on Jalan Tokong in Ipoh named Khoo Eng Chee? No? Then I have failed you. Yeah, no post yet until today because the shop closes on most days and at most times, since they concentrate more on wholesaling their products. If you’re curious as to where the shop is in Ipoh, Khoo Eng Chee is directly behind of Tuck Kee and Big Tree Foot YTF in Pasir Pinji area. Anyway, the resemblance is uncanny. Family run business for decades. In a shop that’s designed sparingly, without much decor. In an older part of town. No bells and whistles of one dining establishment. You walk in, you pick your pieces, you pay and you leave. Every piece of their Nyonya kuih is priced from RM0.90 (USD0.30) onwards. A tad pricey, given the size of each bite-sized piece, yet a price we won’t mind paying here in KL/PJ since good Nyonya kuih can be categorized as scarce. And Nyonya Colors ain’t one of my favourite joint anyway. Most of their kuih were good, noticeable highlights include the Pulut Tai Tai (blue-tinged glutinous rice served with coconut jam/kaya) and Rempah Udang/Pulut Udang (a savoury mix of spicy dried shrimps and grated coconut stuffed into glutinous rice roll, then wrapped with banana leaf). A’Han Nyonya Kuih shop sells various other confectioneries as well, but we did not bother to gauge the quality of these this time around since we were aiming for lunch at Hoe Fong Chicken Rice almost immediately after. Maybe next time then …. since the pineapple rolls appeared to be exceptionally enticing! Map and directions can be found at the end of this post. 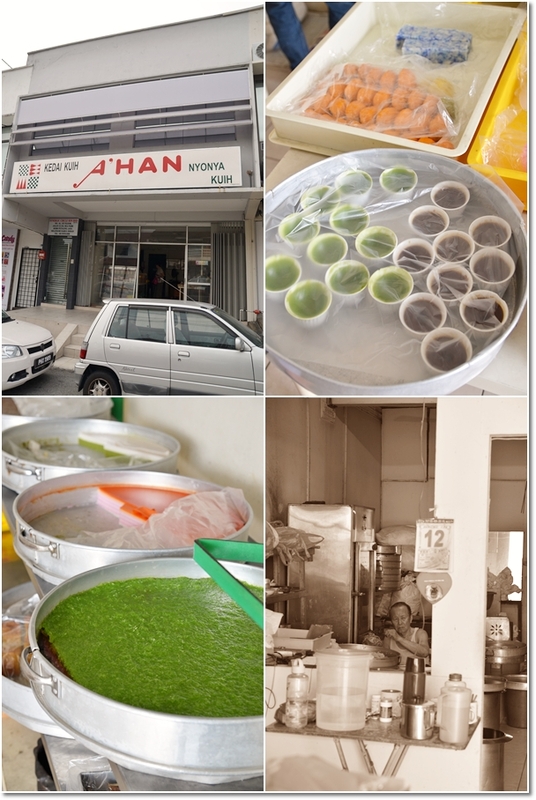 Ahh yes… one of my usual kuih haunts in PJ! Good stuff. 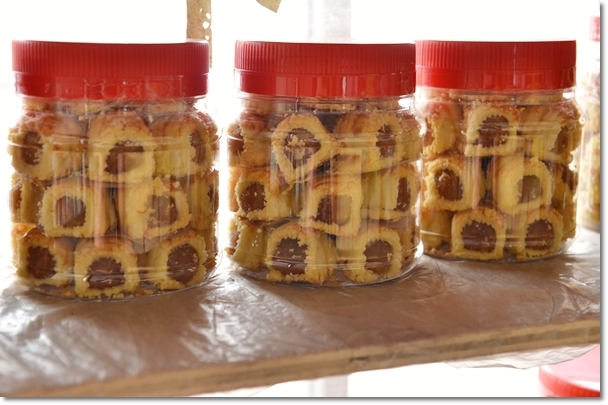 erm me think another aunty who sells in the morning market in Taman Midah taste better…hehehe…this one is a but pricey….such a tiny bite size..
one of my aunts charges between RM0.60 to RM0.90 per piece of nyonya pineapple tarts. lots of process involved….pineapples are chopped manually to retain the juiciness, then cooked on slow fire for a few hours. 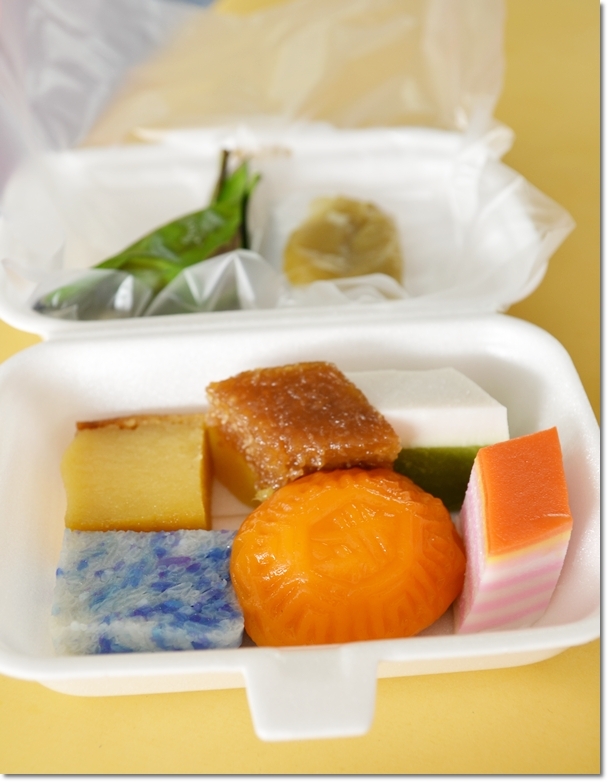 Besides, for you info the kuih was salty , kaya was very sweet and the kuih taste very (melekit) .